Note to parents: Feel free to read this post aloud to your child. This article has been written especially for kids who have recently become a big brother or big sister! So if you have a baby sister or brother who is between 3 and 8 months, here are some ideas and thoughts about how you can play together. First of all, did you know that babies love to play? It may look different than your play as a big kid, but when they are not sleeping or eating or being cuddled, babies are mostly playing! Babies learn through play. They are practicing lots of new skills and exercising their muscles, too! 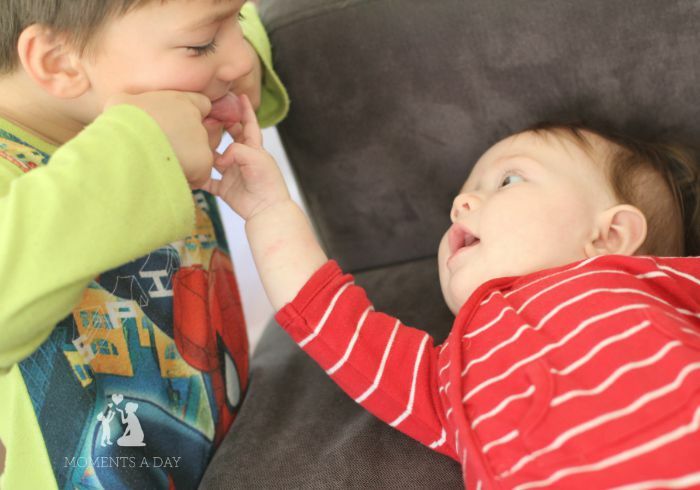 Once you see your baby sister or brother engage with you by looking at you or making noises, it’s a great time to play together! 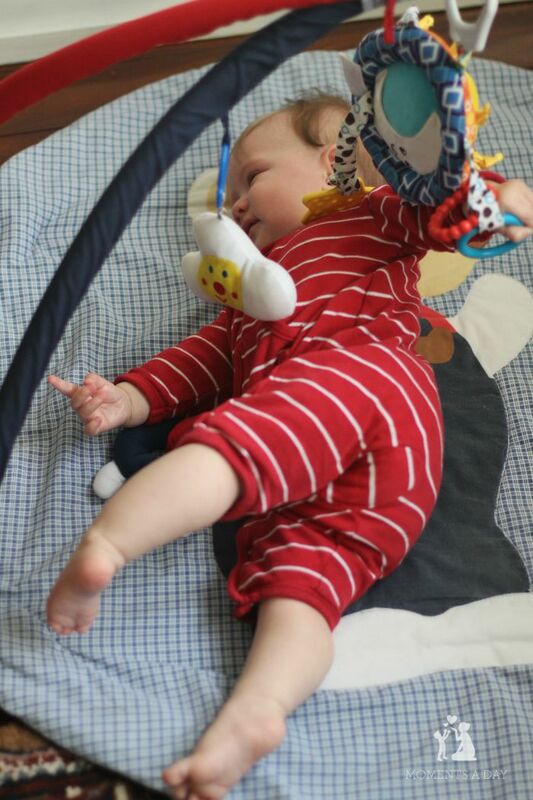 Once babies have learned to grab onto things with their hands, they will start to enjoy playing with baby toys. It is important to check with a grown-up before you give a baby a new toy. 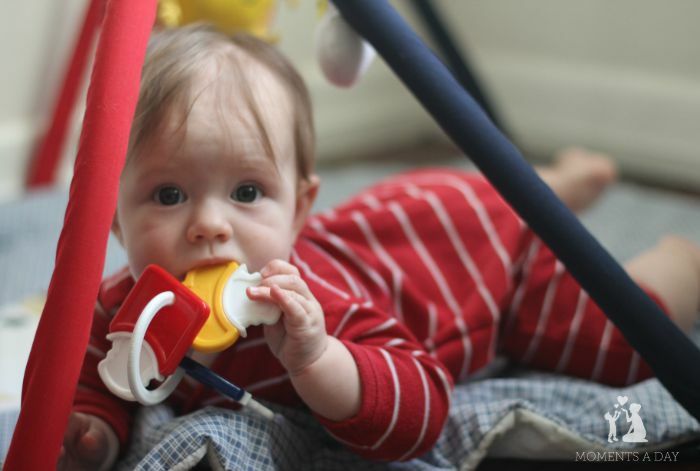 We have to make sure the toy is safe for the baby to put in his or her mouth, since this is nearly always what babies do with toys! We don’t want the toy to be so small that the baby can accidentally swallow it, or too heavy that it may hurt them. If you would like to use something that your baby sister or brother is playing with, don’t forget to ask before you take it. Babies cannot talk but they still have feelings and we should not take anything from them before checking if it is okay first. You can look at their face and listen to their voice to find out what their answer is. This is the way babies communicate before they learn how to say words. All babies have different temperaments and like to do different things. They are different to each other just like big kids and grown-ups. You can watch their reactions to see what they enjoy and what they don’t enjoy. If they are smiling and laughing, they are telling you that they like what you are doing! If they keep turning their head away or start to cry, it is probably best to change the game you are playing. Eventually a baby learns to move on their own! They may roll or crawl. This is a very exciting time for a baby! 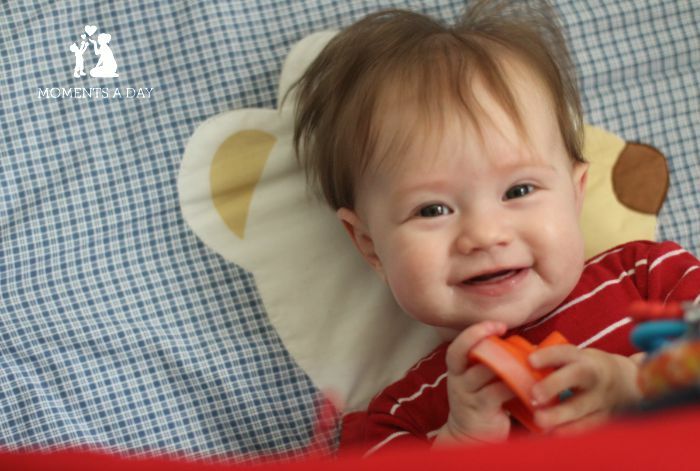 Parents and older siblings can keep the baby safe by making sure there are no small objects on the floor that the baby might put in their mouth and choke on. It is important to watch out for babies and if you ever think they are about to get hurt, tell a grown-up straight away! Did I do something to hurt the baby? Did I do something that scared the baby? If your answer is “no” then it’s probably time for your parents to feed the baby or change his or her nappy. Or the baby may be sleepy and might need to nap! 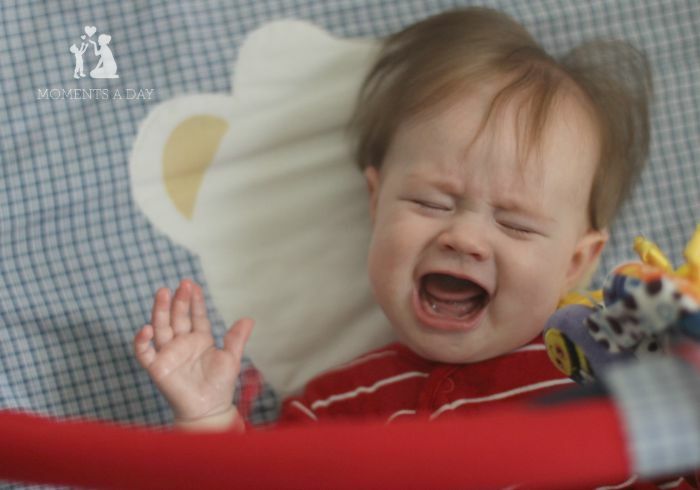 Crying is how babies communicate to us that something is wrong. They are not trying to annoy you or cannot help being loud. If the noise gets to be too much, you can take a little break by going to a different room. 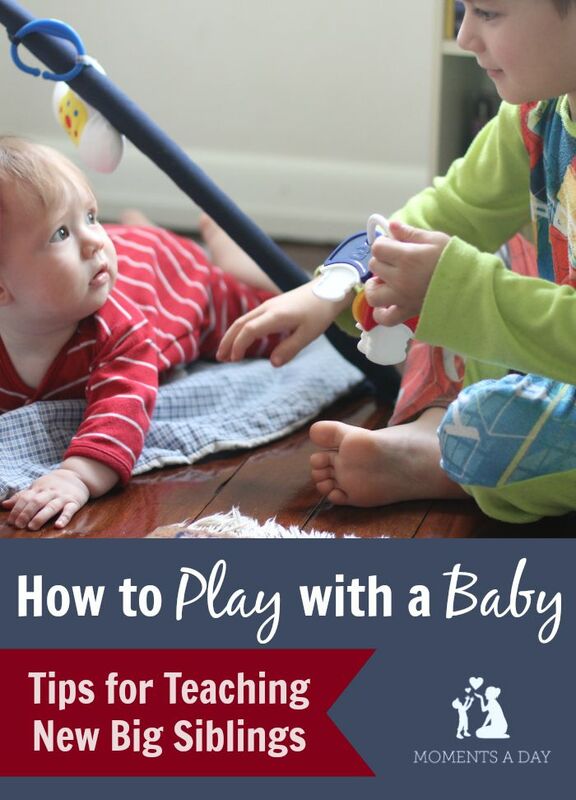 It can be a lot of fun playing with a baby sister or a baby brother, and they are going to learn so much from you. Every day they are watching what you do – like eat, run, talk, and jump – and will soon want to copy you! 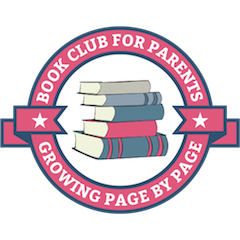 If you have other ideas for ways you can play with your baby sister or baby brother, please share your idea below for other children to read! Hi Chelsea! This is a wonderful post, sometimes new siblings can’t wait to play with the newborn and it is great to explain them that newborns play in different way! Just to see if you have any idea that you can suggest to me how can I keep the little toys away from the little one when she star to go around? Hi Shalimar thanks for the feedback! Everyone’s house is set up differently so I am not sure what would work for you, but when my second son started crawling it was helpful to have a designated room (with a baby gate guarding it) for my older son’s toys (he was about 3 at the time). This time around my older kids will be a bit bigger when the new baby starts crawling (4.5 and 7) so they will understand to keep small things on the table or in their own rooms with the door shut. But probably my personal tactic will be that I’ll just never take my eyes off the baby or make sure she’s in the room with me, so I can watch over her. Kids can’t be expected to keep dangerous things away by themselves, I think. We need proper precaution while playing with a baby; especially in case of siblings. In most of the cases parents are normally afraid of allow an elder baby to play with newborn as due to mishaps. But while go through this article I found that how to teach a new big sibling to play with the younger one; this attitude definitely build a sweet bonding in between them which is helpful for parents to take care of both the kids in same time. Thanks for such a beautiful and informative article I am sure it will definitely refine our parenting skills. A worthy blog to read for parents and kids who have become a big brother or sister recently, you have well- explained how to play with new born child. 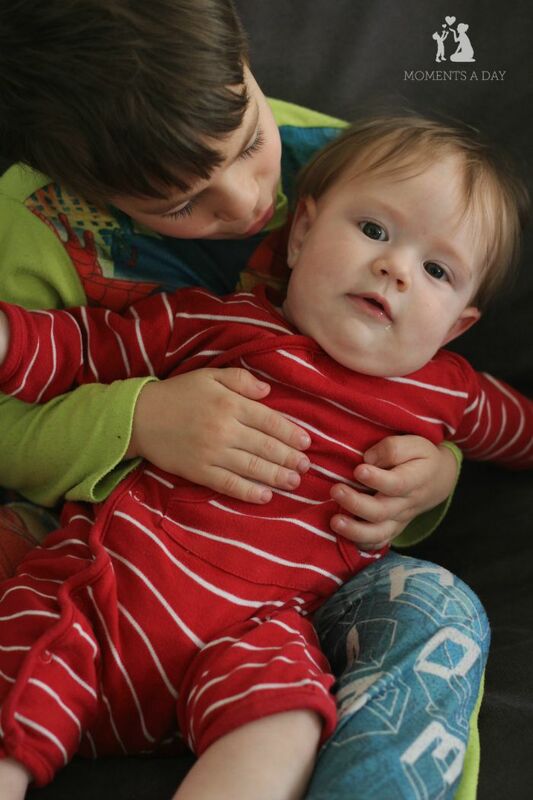 It is really good to make the siblings understand newborns love playing with them.